This year in the Dutch interclub the time limit is for the first time 40 moves in 90 minutes and 30 minutes for the remaining moves with an increment of 30 seconds for each move. Earlier this month this time control was also inconspicuously approved for the Belgain interclub. It is unclear to me if this is a necessary improvement for Belgian chess. Anyway many players do like the new time control. The role of the arbiters is reduced to a minimum and a game is averagely shortened with an hour. My teammate Thierry proposed even to also advance the starting hour to 13h like in the Dutch interclubs so the Sundayevening would become free. Personally I find the loss in quality due to the reduced duration of the game more important than a free sundayevening. If I want to play quick then I prefer to play blitz in a cafe or on the internet but of course preferences and priorities differ. In tournaments with a strict schedule of 2 games per day like Open Gent or Open Leuven, an increment is not an option. Only 1 game must last longer than 100 moves and the organisation has to deal with delays. Because of that those tournaments still choose for the old K.O formula. In 2 hours for the whole game it is still possible to play till move 30 reasonable standard chess. After move 30 the cadence accelerates from rapid to blitz or even bullet. The regulations tell us if we have less than 5 minutes remaining that no more recording of the moves is necessary and that happens regularly when more than 40 moves are played. If a game continues to move 80 or 100 then it is often impossible to rebuild the game afterwards. My teammate Daniel reacted unperturbed when I mentioned him this issue. Analyzing rapid, blitz or bullet is brainless and time-trouble-errors are only a joke. This is a dry practical view about chess. However I apply a scientific approach so I also like to know the truth of the final phase. This edition I was lucky that all my games in Open Gent were live broadcasted. It is a fantastic service of the organisation. This way chessplayers but also friends or family (like my father-in-law sitting in Ufa) can follow my moves live. 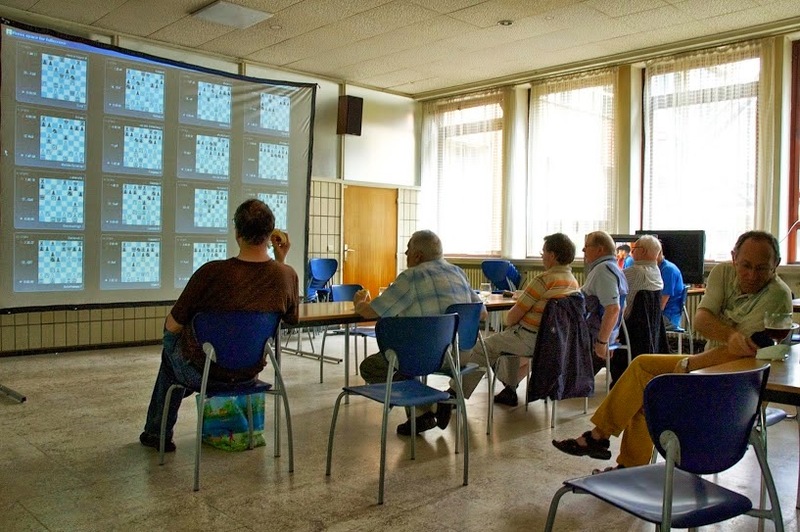 In a neighboring room of the tournament the organisation set up a gigantic screen on which the top 16 games were live projected. Every visitor was free to give comments and at the same time enjoy a drink or some food. Eventually all the involved players got afterwards a complete recording of their games as when players stop then the program still continues. I find it extraordinary how today the equipment succeeds doing this job with such high level of accuracy as in the final phase the pieces are often not nicely put on their squares. For rebuilding 3 of my own games I used the recording of the live boards. The first time was in round 2 against Martijn Maddens. I already covered a piece of that game in my article starflights. Below is the dramatic conclusion of the game. The second game was against Andrew Brown of which I already showed the conclusion in the article bricks. The 3rd game was my 100 moves-game against the Hungarian IM Adam Szeberenyi whom kept on playing a totally drawn-endgame as I had only 5 minutes against his 30 minutes. He pushed till the limit and even over it as on one moment I suddenly got an unique winning-possibility which I unfortunately missed as I was running out of time. So long games are invariably part of my practice which probably makes that I am averagely more active than the normal chessplayer (as earlier claimed in my article food and drinks). However the price for longest game of the tournament was not for me as it went to the dramatic game in round 7 between the Swedish grandmaster Thomas Ernst and our Belgian top-player Mehr Hovhanisian which lasted 108 moves. In fact I can recommend every organisation to install and use live boards. It is a small investment but the return is certainly huge via publicity and entertainment. Possibly still some improvements are possible. In Open Leuven not only a recording of the moves happens but also of the time-consumption per move. Personally I find this information very useful not only to understand better the game but also to make some conclusions as involved player later. Finally an organisation could also add a commentator in the room where a big screen is installed which projects the live games. This can quickly become expensive but I believe a 2200 player can already do the job for a broad audience. Cheating is surely a disadvantage of the technological advancements but there are a lot of advantages.